Spring is often the most popular home buying season. Birds are chirping, flowers are blooming and homebuyers are coming out of hibernation. Many people thinking about purchasing Niagara on the Lake realty will do so in the spring so that they can move and settle in before fall. If you’re planning on putting your house on the market this season, there are several things you can do to make it stand out from the rest. Spring cleaning is a simple, yet necessary step to make your home especially appealing. Here are a few tips to help you win over those springtime buyers. Niagara on the Lake real estate offers some spectacular views. But if your windows are covered in smudges and cobwebs, those views might go unnoticed by potential homebuyers. Take a little bit of time to clean your the glass and ledges of your windows inside and out. This little extra effort will allow the sunlight to pour in and make your home seem especially inviting. After the winter months, getting back into yard work can seem like a daunting task. However, the sooner you get out there with a rake and trimmer, the easier it will be to bring some life back to your yard. Start by raking any dead leaves and debris in your lawn. Trim up bushes and tree branches that have overgrown, so you can show off the exterior of your home. If needed, mow the grass and trim the edges of your lawn around the driveway and walkways. A neat, tidy yard will show homebuyers that you care, which will likely be a good indicator of the state of the inside of the house as well. 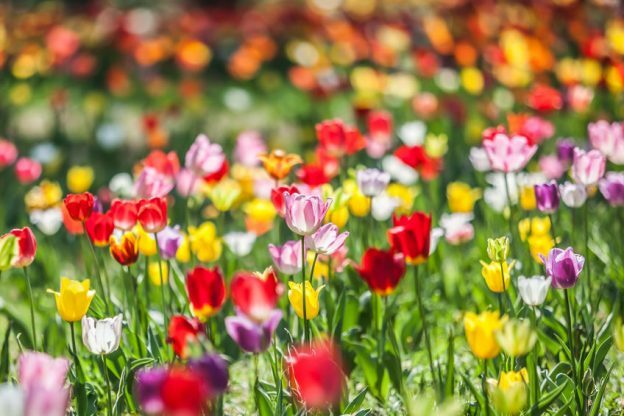 Embrace the season by planting a few tulips or pansies near your home’s entrance. These flowers are a pretty reminder of the season and will make your home seem like an inviting, happy place. You can even purchase or cut a few flowers to place in vases around your home. The natural scents they give off will bring a sense of freshness and vibrancy to the interior of your house. Plus, they’re just pretty to look at! Dull floors can really distract homebuyers from all of the other hard work you’ve put into spring cleaning. If necessary, consider refinishing your hardwood floors so they look like new. Clean your ceramic and linoleum floors until they shine, and bleach any dull grout between tiling. Additionally, make sure your area rugs are thoroughly vacuumed. In addition to spring cleaning, hiring a qualified real estate agent can make the home selling process especially painless. As a long-time local, I know the area very well, and I know what people look for when buying a home here. I will help take the stress out of selling your home and will work diligently to make your property ready for the springtime market. Please don’t hesitate to contact me about selling your Niagara on the Lake home. I look forward to working with you! This entry was posted in Blog on April 14, 2017 by Kevin Stokes.